A day at the NICU of Brigham and Women's Hospital. DtM Director of Product Development, Elizabeth Johansen, asks Dr. Steve Ringer and Respiratory Therapist Janet Rowell to try Pelican. Respiratory Therapist David Beadles tells DtM about common equipment failures at Brigham and Women’s Hospital. Our host for the day was Respiratory Therapist David Beadles. We spoke about one of the inspirations for our project: the adult fingertip pulse oximeters you can buy over-the-counter at CVS. He mentioned, “Springs are always the first thing to fail on those probes. Whenever you have moving parts, you have failure.” Then he took us to see a $2500 sensor cable from a transcutaneous newborn monitor that had worn out and frayed over time. How might we create a device that is portable, but won’t get lost or stolen, without using cables to tie it onto something? Nurse Karen Riedel tries wiping down the student prototype, and then the shoe prototype. We asked Nurse Karen Riedel how she would clean a pulse oximeter between uses. She promptly grabbed the nearby jar of cleaning wipes, put on her latex gloves, and wiped down each prototype. Overall the process went smoothly for all of the prototypes. In the process, Karen noted some difficult-to-clean crevasses on the student prototype near the sensor. Opening the shoe prototype, Karen said, “Oooh magnets! If it comes apart it is much easier to clean. A hard material is best for wiping down.” However, would the top and bottom of the shoe get separated and lost? Respiratory Therapists Janet Rowell and Jill Robinson try the student prototype and dream about adding a timer to help them count newborn breath rate. One of the biggest surprises of the day was learning how respiratory therapists at Brigham and Women's diagnose pneumonia. In addition to measuring oxygen level in the blood, therapists must measure how many breaths the newborn takes per minute. Respiratory Therapists Jill Robinson and Janet Rowell said the standard for measuring breath rate, even at this world-class hospital, is to look at the clock on the wall, then look at the newborn’s chest, and hope you look up at the clock again after 15-20 seconds, then multiply your reading to get breaths per minute. Janet said, “Adding a stopwatch to your pulse oximeter would be great to help us count respiratory rate. Then you wouldn’t have to look away to see the clock on the wall.” Jill asked, “Could you add a function that keeps giving me a 15 second countdown over and over so I can count respiratory rate at any time? That would be very helpful for us!” If we add a timer to the device, it could better serve developing countries who follow the World Health Organization IMCI protocol which specifies counting breath rate. It was amazing to discover that the staff at the most resource-rich hospital could also benefit from a timer to help them count breath rates when diagnosing pneumonia and respiratory distress. All in all it was a great day that gave us a great deal of new information and insights. We look forward to returning to the DtM studio to create a new round of prototypes to test next! Click here to learn more about DtM's work with Brigham and Women's Hospital. If a picture is worth a 1000 words, then a prototype is worth 1000 pictures. In order to get great feedback, it’s incredibly helpful to have prototypes. Comparisons are also beneficial, so we make many prototypes early in the design process. DtM's Makerbot 3D Printer and the pile of prototoypes we've created with it so far. Meanwhile, Elizabeth created DtM's first live interaction app allowing users to interact with a button and display for our shoe prototype. Click on the image to interact with our prototype! Click on the image to interact with our prototype! These prototypes fired the imaginations of dozens of healthcare providers at the Brigham and Women’s Neonatal Intensive Care Unit. Using the prototypes, we received vital feedback about basic ergonomics, and display preferences. Prototypes are even more vital when we perform research in locations with a different culture and language. They take abstract ideas about what could be, and quickly make them tangible to enable us to move beyond words and see how people actually would or wouldn’t use them. We just came back from an amazing full day of Pelican pulse oximeter research at the Neonatal Intensive Care Unit (NICU) at Brigham and Women’s Hospital, hosted by Design that Matters board member Dr. Steve Ringer. 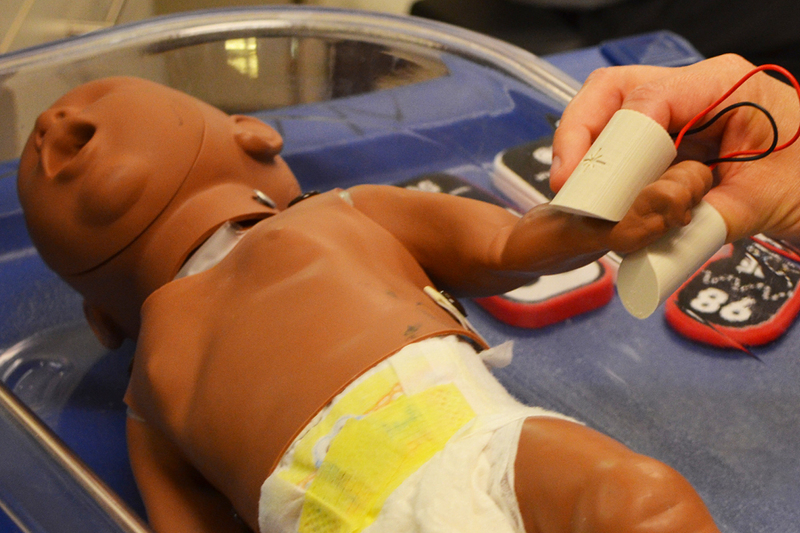 Brigham and Women’s NICU is one of the best in the world, so it’s a great place to observe how to diagnose and treat newborn pneumonia under the best of conditions. If medical devices fail to meet the needs in this resource-rich environment, they will certainly fail when they are transferred abroad where staff don’t have as much training, power fluctuates, and replacement parts are not locally available. We learn the most when we can see a variety of healthcare providers in the setting where they provide care. Before any meeting, we create a research protocol, including goals for the day and observations to make, questions to ask, and activities we would like to do. We discussed the goals for the visit with Dr. Ringer, as well as rules around interacting with staff, patients, and taking photos. Dr. Ringer then reached out to a variety of people in the NICU and arranged for Respiratory Therapist David Beadles to host us for the day. Left: Our research protocol and camera are ready to go. Right: Will Harris pushes our borrowed cart to display prototypes throughout the NICU at Brigham and Women’s Hospital. We started the day by peppering David with questions, which in turn enabled him to learn what kind of information could be most valuable to design the Pelican pulse oximeter. Using his knowledge of the Brigham NICU culture, David had us don scrubs, he grabbed an empty cart for our prototypes and introduced us to nurses in each bay, paving the way for us to reach out dynamically to all the healthcare providers for the rest of the day! The Brigham and Women’s staff went above and beyond to make us part of the team. Nurse Briana Donnelly tries out the Pelican student prototype and then draws her desired display. Before arriving, we generated additional materials like flashcards to compare device features, and prototypes to simulate use. Tangible materials help us spark conversation about latent needs that are hard for people to express. We even had healthcare providers draw their desired device display to better understand how to meet the needs. DtM Indiegogo Closes with 130 Contributors & 228% its Goal! We did it! We reached over 228% of our funding goal, thanks to 130 contributors from the United States, Canada, Europe, Australia, and Kenya. Over 39 days, 4249 people visited the Pelican campaign from 35 countries, spreading awareness about childhood pneumonia across the globe. Your help will allow us to push forward with the development of the Pelican Pulse Oximeter. We'll continue to build awareness of pneumonia as a major global health issue. Congratulations to Ashley McGregor Dey, winner of our Squawking Pelican Contest! Ashley shared the Pelican campaign through Indiegogo’s social media links, leading to 50 people visiting our campaign. Runners up are Bre DiGiammarino and Kevin Wiesner with 26 and 20 campaign visitors respectively. Thanks again for all of your help! We couldn't have done it without you. If you or someone you know is still interested in contributing to the campaign, you can make a secure donation to Design that Matters on our website! Holy Smokes! DtM Pelican Indiegogo Passes 100 Funders! In just 4 days we have gone from 66 supporters to over 100! This is totally unexpected and incredibly exciting news! We can't express the importance of this outpouring of Pelican support as we begin to scale the project. Help us build the campaign further as we continue to raise awareness for newborn pneumonia, the number one killer of children under five. Your show of support means more attention and resources to solve this serious problem and bring us closer to a world of happy moms. Please help us by sharing on Facebook and Twitter, blogging, and spreading the word! Thank you! We are incredibly proud with all that the team has accomplished this past semester, and can't wait to test the concept in the field with a variety of our internal sacrificial concepts. Thank you Aditya, Esther, Keiichi, Kevin, Leah, Phillip, Shubhang, Victoria and Wei for all of your hard work! We look forward to working with you as we move Pelican forward! Check out a video of their concept below! DtM Indiegogo Reaches $10K Goal! We made it to $10,000! Thank you so much to our 66 supporters. We still have 24 days left, and we have set a stretch goal of reaching 100 contributors! Conducting user interviews with a variety of stakeholders including local nurses and moms. Creating a “works-like” prototype design with all of the electronics necessary to work as a real pulse oximeter. Creating a “looks-like” prototype design that takes into account both the mechanics and usability. Building new relationships with local health care providers who have experience in global health and will assist DtM throughout Project Pelican. Designing the groovy Pelican logo we have adopted! We are just weeks away from the student team’s final presentation and we can't wait to see what they produce! In honor of Mother’s Day and mothers around the world, Design that Matters invites you to support our crowdfundingcampaign, hosted on Indiegogo's freshly redesigned platform. We are raising $10,000 to launch the Pelican Pocket Pulse Oximeter Project to create a durable, affordable tool for diagnosing babies with pneumonia. We’re also raising awareness of pneumonia, a condition that we in the U.S. hardly ever worry about, and the #1 cause of death in children under five. Even if you can't contribute financially, please help us spread the word about Project Pelican and pneumonia awareness! This week DtM Designer, Will Harris, traveled to Providence to create some quick “sacrificial prototypes” with RISD Industrial Designers Leah Chung and Kevin Wiesner. Sacrificial prototypes are the earliest of early stage prototypes that are used in product design to illuminate what you don’t know about the problem, and more quickly reach a realistic concept. 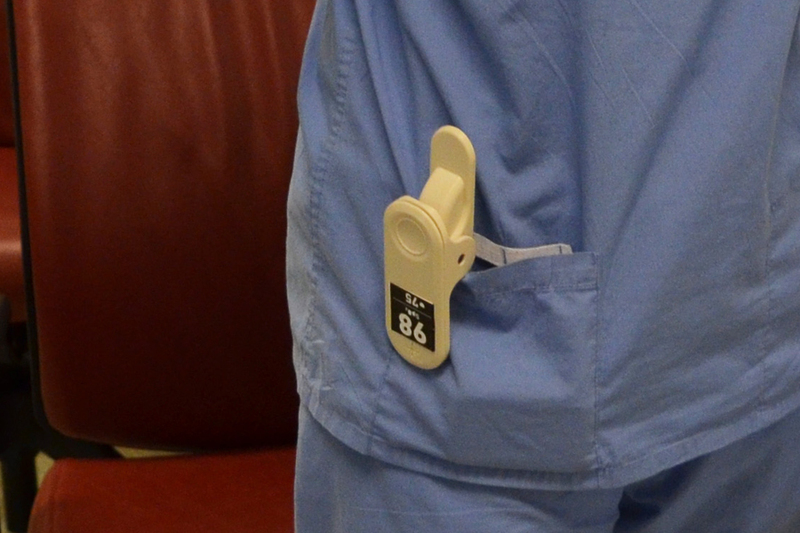 Some of our internal Pelican “sacrificial prototypes” helped us better understand that we did not fully understand the problem of medical devices accidentally “walking away” from hospitals. Making physical mock ups of the driver board the select along with different battery sizes. After doing that and seeing the actual sizes we were able to start making sketch models based upon those components. Creating very simple models and embraced the free pink (blue in this occasion) foam that the RISD model shop had, and focused more on what types of forms or mechanisms that needed to create to fit different sized infant feet. Were able to create six new concepts that can form to various newborn feet. It was an incredibly productive day that lead to some of the first student team physical concepts, allowing them to start doing user interviews at Hospitals around Boston. We have launched our first Project Pelican student team to tackle newborn pneumonia! The DtM Pelican project pitch attracted a nine-member multidisciplinary team from the MIT & Rhode Island School of Design Product Design and Development course. The team, composed of industrial designers from RISD, MBA candidates from MIT Sloan, and engineers from MIT will spend the semester crafting everything from the Pelican business plan to looks-like and works-like prototypes. We are excited to welcome Leah Chung, Phillip Daniel, Keiichi Onishi, Esther Mangan, Aditya Ranjan, Shubhang Tandon, Kevin Wiesner, Wei Wu, and Victoria Young to the ever growing list of DtM collaborators. We can't wait to see what they create this semester! Say Hello to Project Pelican! Say hello to Project Pelican, DtM’s new program to design a pulse oximeter to diagnose newborns with pneumonia. Keeping with the animal themed project names from our most successful projects, Kinkajou and Firefly, the name Pelican was chosen due to the way a pulse oximeter hugs a newborn’s foot reminding us of a Pelican beak. A 2013 Unicef report revealed pneumonia is the leading cause of child deaths worldwide. In 2012, over 1.1 million children, including 330,000 newborns, died of pneumonia. To put this in perspective, 132,000 children died from AIDS, and 462,000 children died from Malaria. Though 1 in 4 childhood pneumonia deaths are newborns, technology targeting newborns remains overlooked. 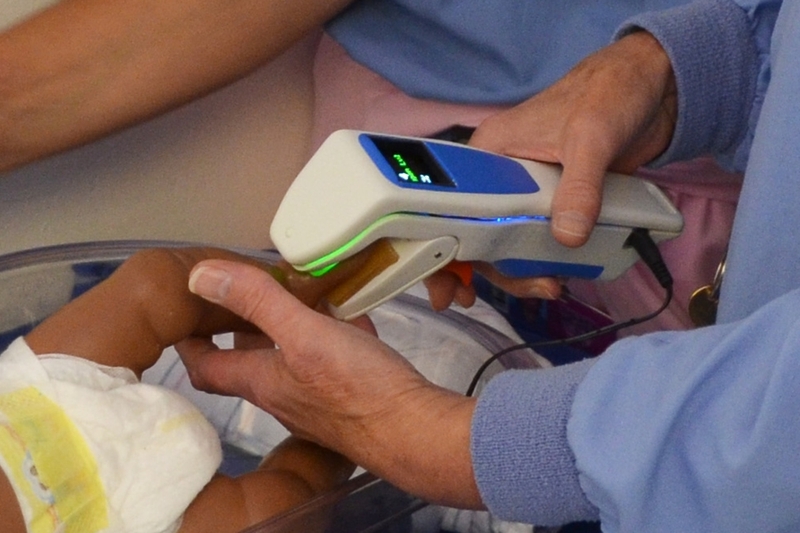 A pulse oximeter is the best way to identify newborns in need of oxygen, and diagnose pneumonia. We are currently designing a spot check pulse oximeter to solve this overlooked problem, and reach 1 million newborns.